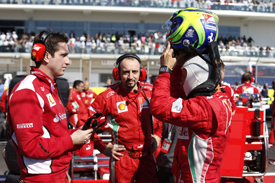 Fernando Alonso says he was proud of his Ferrari team's decision to incur a deliberate penalty for team-mate Felipe Massa during the United States Grand Prix. The Italian squad decided to break a seal in the gearbox of Massa's car at Austin in order for the Brazilian to get a five-place grid penalty that would move Alonso up to seventh and, more importantly, to the clean side of the track. Drivers on the dirty side of the circuit were at a big disadvantage for the start. Although the decision caused controversy, Alonso has backed the call, which allowed him to jump from seventh to fourth by the first corner. "I am proud of my team for the strategy decision to start on the clean side with both cars," said Alonso ahead of the Brazilian Grand Prix. "It worked quite well and perhaps because it worked well maybe that is why [rivals] are not happy. "I am proud of my team because they told the truth. Not every team has told the truth when they have made strategic decisions." Alonso said he found the reactions from rival teams to be "funny", as he feels everybody would have done the same. "Funny. I think we have seen so many things coming from the teams, not only this year, but also in the past in F1," he said. "We don't need to go too far with some of the races where we had some doubts, even on Saturday night, about which teams and which position they start depending on some decisions. We saw this many times for many teams." World champion Sebastian Vettel, fighting for his third title with Alonso, said his Red Bull team would have opted for a different approach. "What they do is not in our hands. I didn't follow up whether Felipe had real trouble with the gearbox or not, but it is not our job to focus on these things. "It is a different approach compared to our team. That is how life is, everyone handles certain situation in a different way."